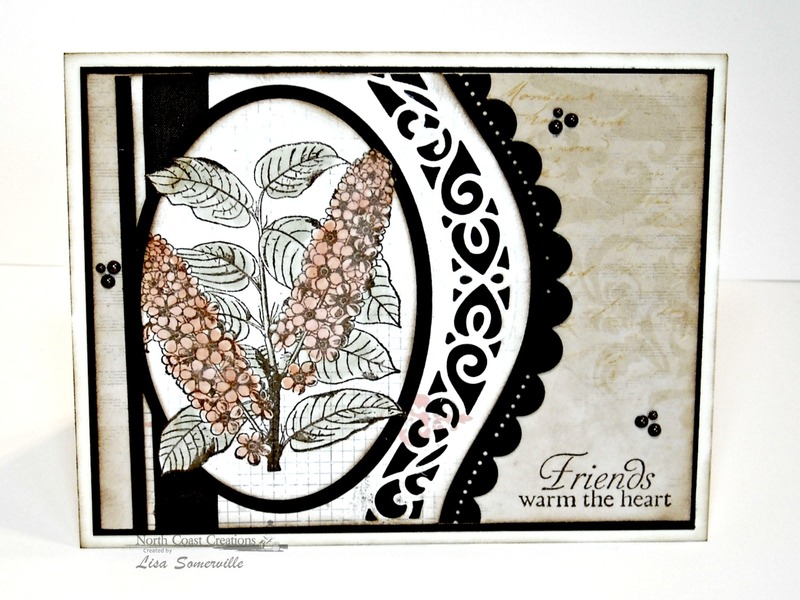 Designs by Lisa Somerville: Fabulous Florals - North Coast Creations February Release! Fabulous Florals - North Coast Creations February Release! Welcome to North Coast Creations February Release! This month, North Coast Creations is releasing three more beautiful vintage Floral Sentiment Sets: Floral Sentiments 4, Floral Sentiments 5 and Floral Sentiments 6. Continue reading below to find out how you can win one of two North Coast Creations $10 Gift Certificates good towards the purchase of NCC Stamps. The cards I'm sharing today, use images and sentiments from North Coast Creations Floral Sentiments 4 and Floral Sentiments 6 stamp sets. To coordinate with the soft colors in the Bo Bunny pattern papers, I added color to my images using STAEDTLER Karat Aquarell Watercolor Makers and a Waterbrush. Both cards use the Out of the Box Technique using Nestabilities. Two randomly selected winners will each receive a $10 gift certificate to North Coast Creations, good towards the purchase of NCC stamps, just for commenting on the Design Team cards! You have until Monday, February 24th, at 10:00pm EST to leave your comments. Winners will be posted February 25th, on the North Coast Creations Blog, so be sure to check back there to see if you are one of the winners! Oh wow both such beautiful designs. Love the softness. These are both so soft and pretty! Both are so pretty, Lisa! Love the soft, understated color and pretty layouts. The black borders make them pop. Lisa both of these are lovely. Your soft coloring on the first one is perfect. The fun design on the second is so cool. Very pretty cards. Love the pretty curve on the second card -- it is so beautiful! 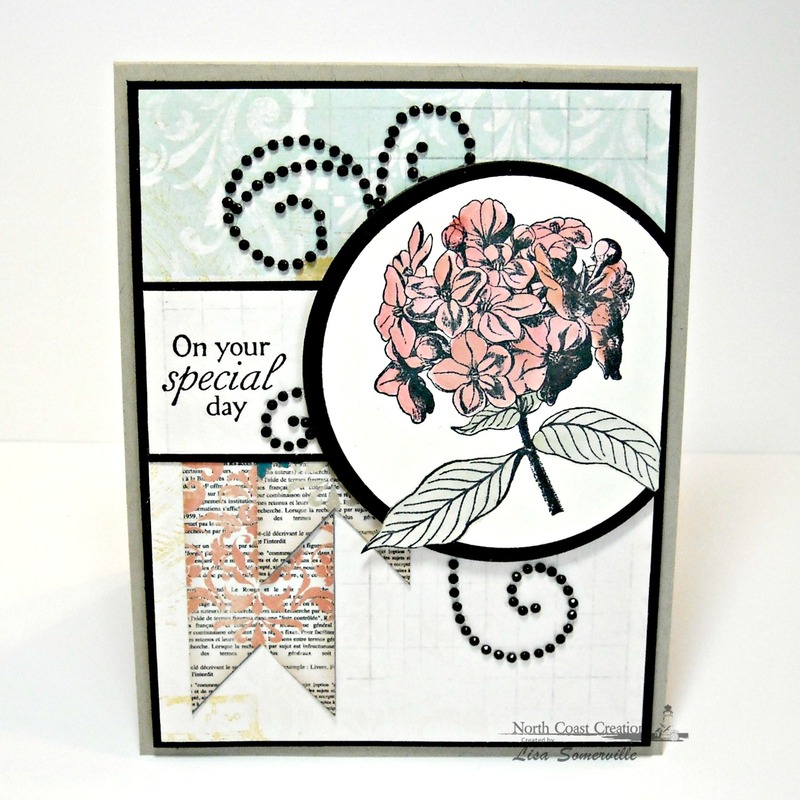 Love the softness of the flower colors on your cards, adds a pretty vintage feel to them. Beautifully done. Wonderful use of the black and white to showcase the flowers! lovely layout. It reminds me of vintage advertisements in newspapers, to make you think of joy an spring, with the soft water color. Much to think about with these gorgeous new stamps. Love the simplistic appearance of these cards, knowing that they are not simplistic. Great designs, great stamps, great choice of colours. Love the out-of-the-box technique. Very nice. Beautiful cards Lisa, lovely stamped and colored images. I think your cards would also fit into the elegant and classy style too! The black really makes this card pop. Very pretty. very pretty, just love the image off to the side and the use of the banners and cool use of the border die to frame, neat design on both cards! The way you colored them gave the cards a vintage look. Great cards, both of them! So soft and pretty. I love your choice of colors. Thanks for playing along with us at The Card Concept this week.